I am a cleaner. I can help you clean and improve your violin technique using my own method called The Shonert Technique. I give both in-person (Prague, Czech Republic) and online lessons. I prefer to work with advanced students but I am able to teach advanced beginners after one year of playing the violin as well. 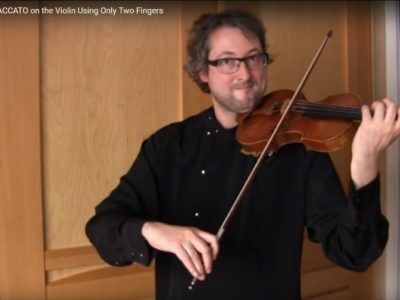 I have developed a method, called The Shonert Technique, which has enabled my students to successfully learn the most difficult violin techniques in a very short period of time. I not only teach violin but I also teach how to think about it correctly. The skills I pass on to my students are useful in many aspects of life. I can teach in person, master classes or online. I can also give preparation classes for the British ABRSM exam for all grades. Besides learning to play firm staccato, The Shonert Technique will empower all your bowing strokes and styles with a beautiful, clear and bell like sound that is guaranteed to move the hearts and emotions of your audience. What are the benefits/rewards of The Shonert Technique? Knowledge should not be confined to learned tomes on dusty shelves, but should be made available to everyone who needs it and to all who are willing to learn. My aim is to put my thoughts and ideas at the ready disposal of all, whether they be novice students or veteran performers. I am a cleaner. I can help you clean and improve your violin technique using my own method called The Shonert Technique. It’s a powerful, and effective technique helping you clean out all obstacles to optimal performance, such as fear, stiffness and nervous tension. I teach how to feel and relax your hands and how to get results in the form of beautiful and steady sound you always dreamed to have, all without using muscles strength and pressure. If you are an advancing student, you may be inclined to think that trying my technique would conflict with what you are learning from your teacher. I assure you, it will definitely not, but rather enhance existing techniques you’ve been taught. My technique is, unlike any other developed before, so effective, that you can apply it to multiply your productivity and quality in any area of your life involving performance, not just in violin playing. I am not a competitor for your teacher. I have my own method how to do it. I can also teach you how to practice at home correctly and get more result for less period of time. One of the most important features of the method which I developed is that I don’t just teach playing the violin but also I teach to think in the right direction, and the skills which I give to my students can be of practical use in life, which especially concerns working with energy. 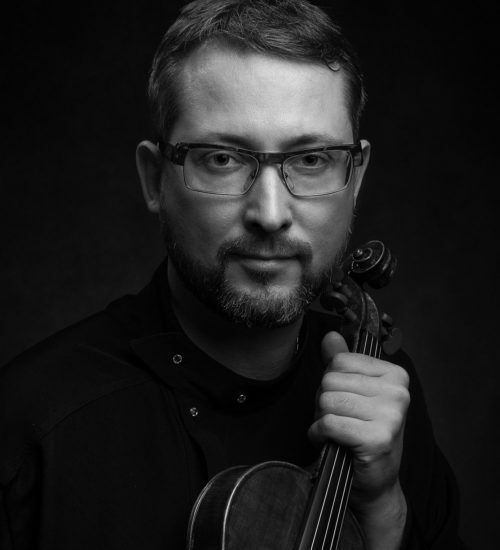 I have been able to join the Chi energy and the violin together and use that energy to get more efficient technical skills such as a firm staccato. It is important to know that this method helps to gain beautiful and deep sound without using force. It is absolutely natural to use these techniques in martial arts but in music you rely more on intuition and, in my opinion, it is a mistake as all laws of physiology and energy are the same. The Chi energy follows the same rules whether you use a sword or a bow. The difference is only in goals: the sword is for battle and the bow is for playing the violin. I’m a teacher, but sometimes (and quite often) I feel myself as a doctor. The most important thing in being a doctor is to make a timely and correct diagnosis. I see when and where the student has a problem. Moreover, I look for the cause of this problem which prevents him from executing a particular technical skill or from playing a piece with sufficient expression. After I make a diagnosis I give advices which could help student to overcome the problems he faces in the shortest time. One of the secrets of my method is that I use the laws of psychology. The student more quickly absorbs the information if he receives it associatively. During my lessons I love telling parables. Here is the parable which shows the point of my method. Three persons got the task to break a heavy wall using only his hand. One person beat it for an hour, bruised his arm and decided to stop. The second person beat it for seven hours and even broke the wall but after that he lost consciousness. The third one first of all studied the wall for two and half hours, found the thinnest point and the least power that should be used to break the wall, and then broke it without harm to his body. My method is more about the third person. 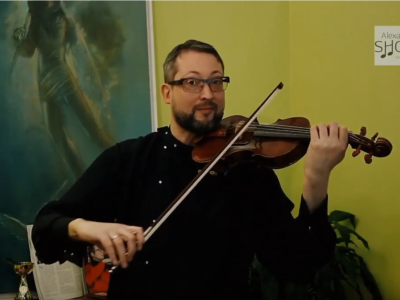 Getting a proper violin technique requires not only time but also the efficiency of lessons. As my professor used to say, “Playing the violin requires more work from brain than from hands”. 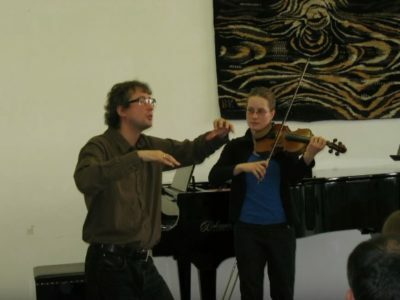 But the most important thing is that in helping the student to get this knowledge, I want him to use it not only in music but in other spheres of his life even if they are completely different, because the even the most perfect knowledge of technique is only the first level – we can reach spiritual perfection from playing the violin or from martial arts. It is a philosophy, a style of life. The father put his son in music lessons. The boy then played at home for days on empty strings, made a bow strokes up and down. One day violinist David Oistrakh appeared on TV; The father told his son, “Look how he presses tones along the entire fingerboard while you’re still playing only empty strings.”The son replies,” Dad, Mr. Oistrakh’s still looking for that, but I’ve already found it.”That’s the trouble. A lot of people think they have found it, and do not want to change anything.